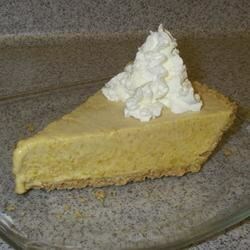 "Even if you don't like pumpkin pie you will really like this one. Its an old, old recipe, but good. It is a 1950's recipe of my mothers. For a beautiful presentation, top each slice with a dollop of whipped cream and a walnut half." Combine pumpkin, brown sugar, salt, and spices with a rotary beater. Blend in ice cream. Pour into pie shell. Freeze until firm. Serve frozen, garnished with whipped cream and walnut halves. Delicious! Only used 1/4 cup of brown sugar and it was plenty. Next time will add more pumpkin.